The inside of your home shouldn’t have all the fun. Bring your fall decorating outside this year, using cues from nature mixed with your own personal style. It’s absolutely possible to achieve that “Wow” effect without digging too far into your pockets (or pocket book). These are the days of endless decorating ideas that don’t come with a high stress level or a high price tag. 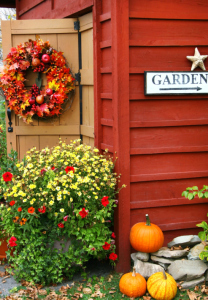 Here is our handpicked, budget-friendly, curb-appealing collection of outdoor fall décor ideas and projects for your yard, porch, patio and door. Enjoy! Whether you like to mix and match colors or you prefer the cohesive look of one color, you can create a stunning one-of-a-kind display. Use color abundantly throughout your designs, accenting the natural hues of harvest. Shades of gold, red, orange, yellows, deep greens, browns and even purples can be incorporated into your wreaths, floral creations and other fall decorations. Coordinate your chosen color patterns into fabrics – blankets, throws, outdoor braided rugs, pillows and cushions. Add mums for bright pops of accenting color. Learn how to spray-paint (and stencil) your pumpkins for a matching look. Nature provides all the inspiration you need. Collect fall finds anywhere from your local arts and crafts store, or stroll through your backyard for a truly natural outdoor fall décor. Corn husks, colored corn cobs, branches and berries can be wrapped around columns or added to planters, garlands and wreaths. Traditional and heirloom pumpkins and gourds can be stacked, piled or scattered on the front steps and porch. Crab apple branches, with their fresh fruit and lush leaves, can be added to a watering can or pitcher for a patio table centerpiece. Use natural elements such as raffia, straw, wicker and rattan to offset the bright colors of pumpkins, gourds, berries and fabrics. Anything from burlap to dried apples can be used to make an amazing fall wreath that balances color with natural fabrics. Transform your outdoor patio or porch into a cozy “fallscape.” Add comfortable, autumn-inspired fabrics to your outdoor furniture (think: accent pillows on chairs, throws and blankets on the porch swing). Place bowls of fresh pears and apples on tables. Add festive touches of color to any existing pots and planters, sitting or hanging, for a festive and cohesive look that will last well into November. Pumpkins are not “one size fits all.” They are available in various colors, sizes and shapes with limitless potential. Create a pumpkin topiary for your front steps, using anything from a birdbath to a decorative plastic urn as the base, stacking pumpkins for an elevated yet simple look. Fill baskets large and small with a mixture of pumpkins, seasonal squash, gourds, leaves, branches, etc. Any assortment of your favorite fall finds will do. Give chairs, wagons, birdbaths and wheelbarrows (or anything with the capability of holding items) a new purpose. If you’ve run out of creative pumpkin juices, think about other materials that you can stack, pile or scatter. 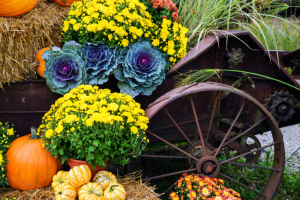 Old crates and hay bales look great stacked on your front steps and provide a solid base for pots of mums, sitting scarecrows or anything else you want to show off. Don’t forget the lights! Besides the seeds, carving pumpkins is a long standing tradition that produces a beautiful end-result that you can display day and night on your porch or patio. Lit pumpkins scattered or placed on top of any base really takes your outdoor fall décor to another level when the sun goes down. String garlands around columns and add lanterns throughout displays for 24-hour curb appeal. Outdoor fall decorating does not have to be a challenge or a chore. Enhancing your home and yard for the season should be nothing short of enjoyable. Create an atmosphere of “play” rather than “work” by taking a care-free approach to your décor. 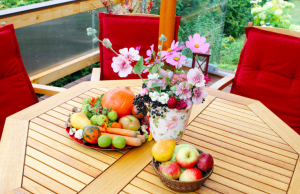 Remember that your outdoor fall displays most definitely do not have to be perfect! Plus, you can always take the totally-stress-free route and hire Greener Horizon to design and install a professional seasonal display for you. Get creative and play with materials, textures, colors and sizes. Search through your basement, attic, garage and barn for unused items that can be repurposed into your fall displays. Old tables, chests, doors, chairs, drawers, rakes and tools are all fair game. Festive fall outdoor décor is a wonderful way to celebrate this colorful New England season your way!